If you’re lucky enough to have a fireplace in your cozy family room, then you should respect it and decorate your mantel. The mantel is the perfect place for seasonal decorating. It’s a small piece of real estate, but usually the center of attention for whatever room it’s in. I have to admit, I do sometimes forget to decorate it, though. 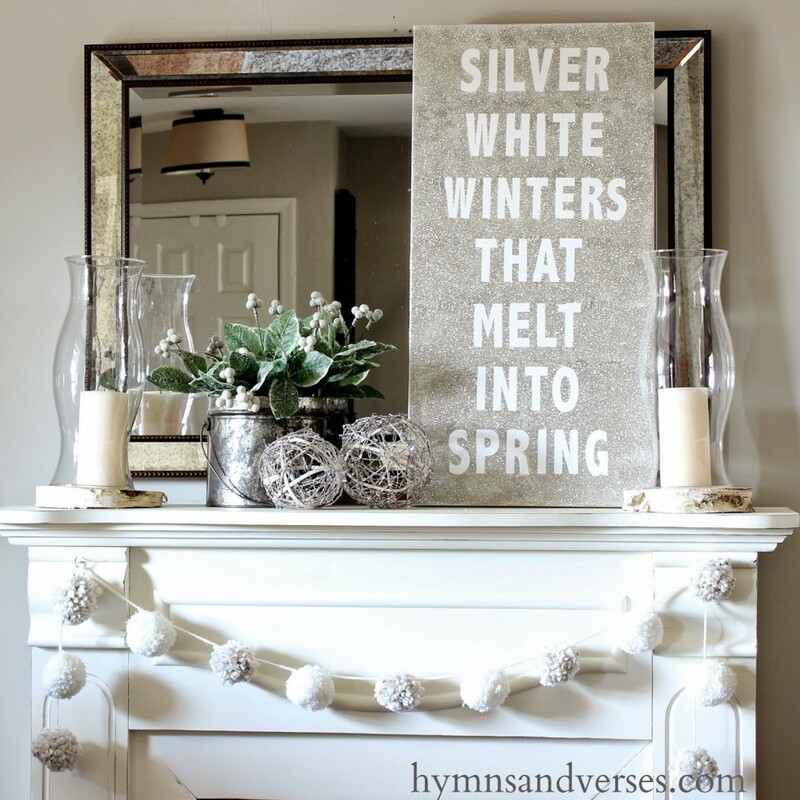 So I’ve found beautiful mantel decorating ideas for every season. White and silver is perfect for Winter. I love the texture from that garland and the bit of glamour from that shimmery DIY sign. Doreen at Hymns and Verses has the tutorial for the DIY sign if you’d like one for yourself! I think I found my next project. I adore this framed word art for the mantel from The Lily Pad Cottage. That’s gotta be DIY-able, right? It looks like it was originally from an Etsy shop, but I don’t see it there anymore. I also love the mix of natural wood and birch bark candles. It’s wintry and warm at the same time. 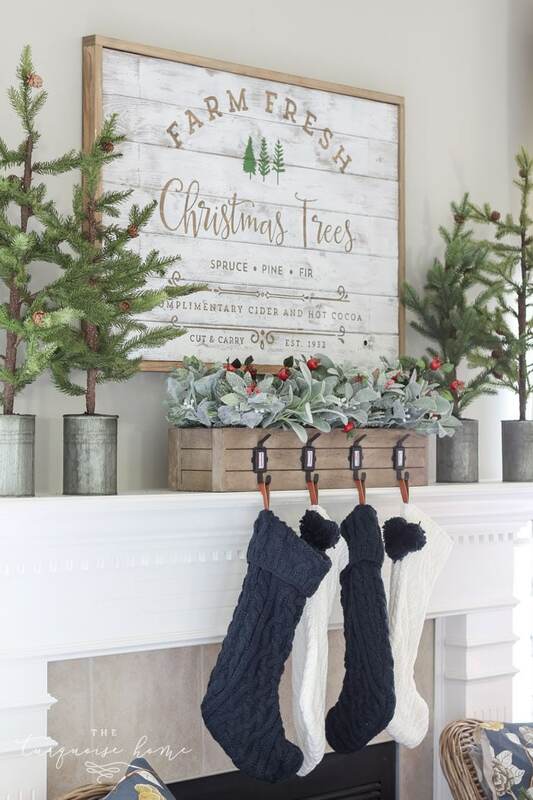 This lovely mantel from In My Own Style is a favorite because it is simple. I love the soft neutral colors with the pop of green from those greens. What’s great about this mantel is the before and after. The addition of those pitchers with the greens really do make a big difference. And such a simple thing to do. If we’re talking Winter Mantels, we can’t skip Christmas mantels, can we? I obviously have a thing for word art above the fireplace that I’m going to need to address. 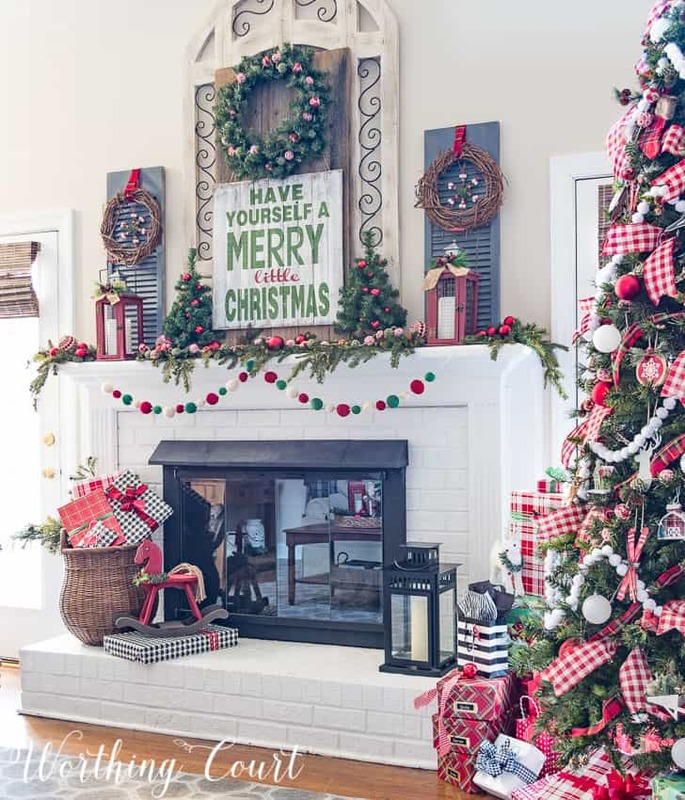 I love this pretty flocked mantel from Liz Marie Blog for Christmas. If you’re a careful editor, this can also be your Winter Mantel after the holildays. Nothing says Christmas as well as Red & Green. And this mantel from Worthing Court does it perfectly. If you’re looking for something simple and minimal, this mantel from The Turquoise Home is perfect. I’m a sucker for anything that includes navy. Just ask my bedroom walls. (Navy). I don’t know about you, but by March, I am itching for Spring anyway I can get it. It’s usually still COLD and even snowy in March here, so the way to sneak in some Spring is with your decor. Just give Mother Nature a couple of hints with some pastels and florals and a pretty Spring Mantel. This might be my favorite mantel of the whole bunch. This pretty, poppy Spring Mantel from 2 Bees in a Pod has everything I love. That bright green screams spring. I’m ready to go DIY that star, like right now. And the watercolor pillow is all kinds of pretty. 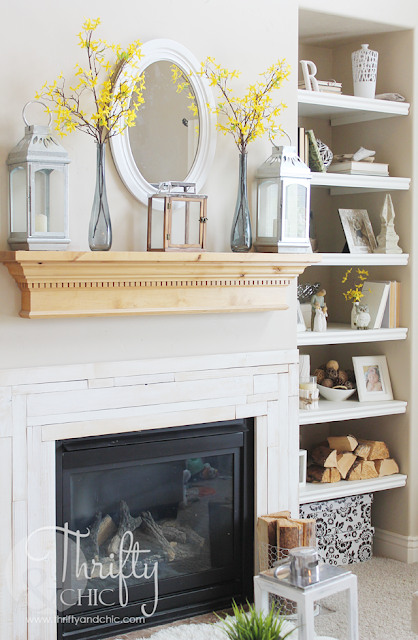 This pretty mantel from the Lettered Cottage is full of fun DIY’s. I love the white on white look with just a few pops of that super springy green. Hm, and again, words above the fireplace. Definitely a theme happening here. I picked this pretty mantel from Classic Casual Home because it’s very versatile. 90% of the decor on the mantel could stay up all year long. 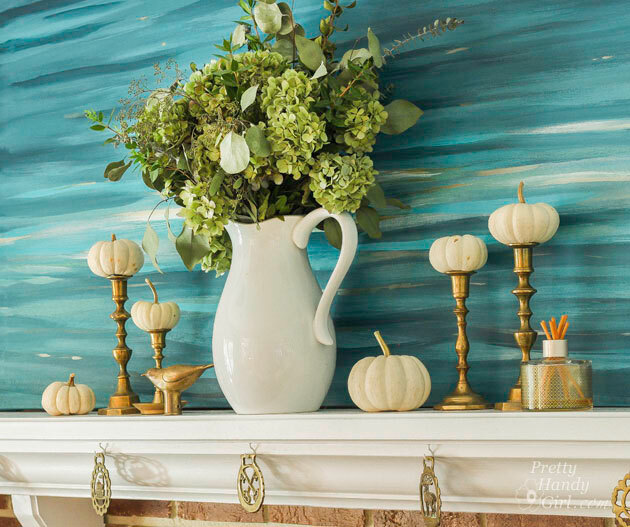 Change out just a couple of things, like the filler for those vases and maybe the coral (unless you’re in that type of climate) and this is an easy peasy mantel to keep on trend with the season. What I’ve learned by scanning through all of these many and varied mantels is that I like simple. The one sure fire way to fail at Mantel Decorating is to have too much going. 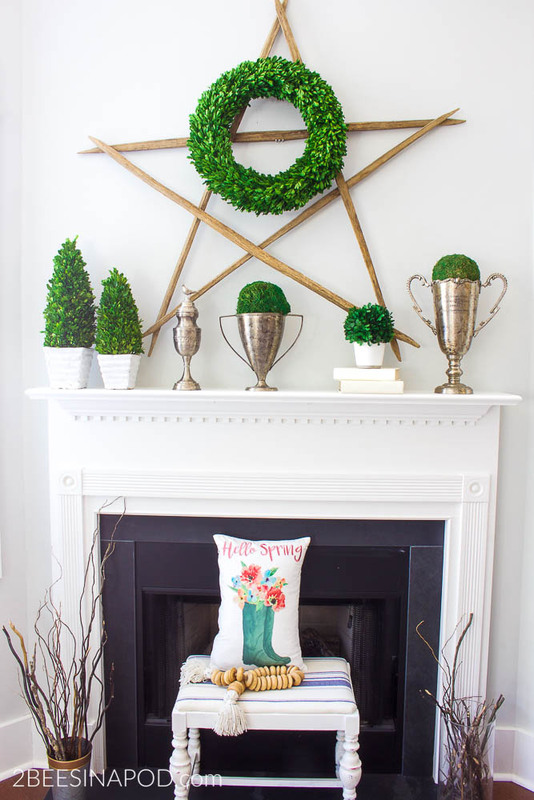 This Spring Mantel from My Life From Home is perfectly simple. Or simply perfect. Either way, it’s a nice balance of just enough stuff. Just enough color. A touch of texture. I love it. I tend to ignore indoor decorating when Summer rolls around because we don’t spend a lot of time indoors when it’s nice out. So if I’m decorating my mantel for Summer, it’s going to need to be a quick and non-fussy project. If you are lucky enough to have Hydrangeas in your yard, then you are very lucky, indeed. 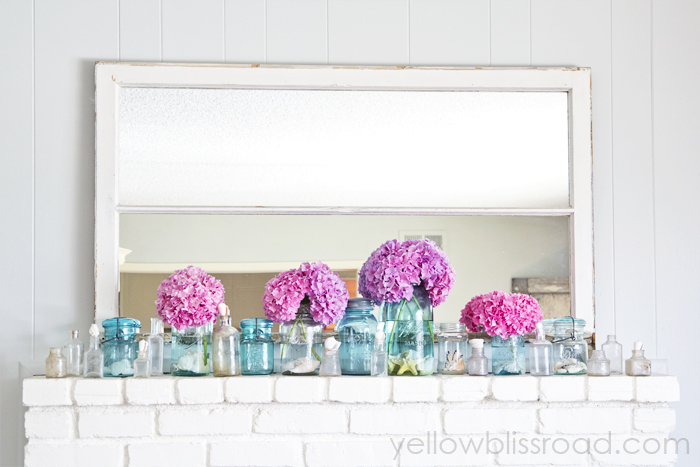 This summer mantel from Yellow Bliss Road is so perfectly summer and easy. Blue and green are my favorite and they are perfect for summer, reminding you of the ocean or the lake or some other watery escape. My favorite part of this summer mantel from Finding Home Farms is the Starfish garland. You know I love some pops of color. I adore that shade of yellow on that shutter on this summer mantel from Tater Tots & Jello. 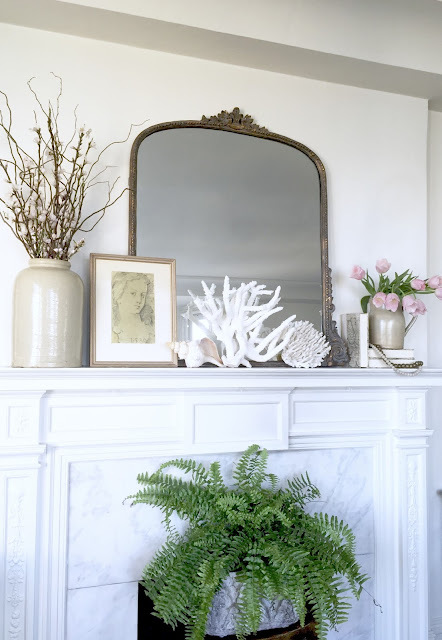 This coastal summer mantel from The Frugal Homemaker, of all of these mantels is probably the coziest, to me. I love the whole thing. Teal and yellow is a great color combo. There’s tons of texture happening with those blankets and pillows. 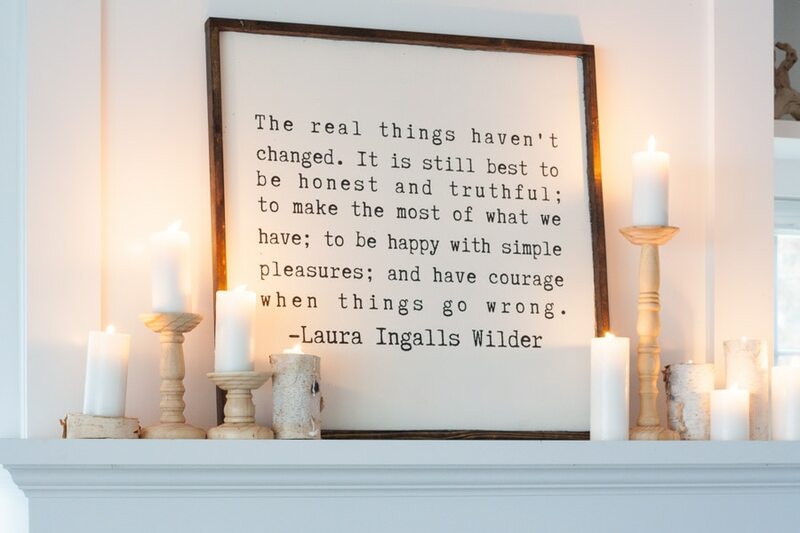 And the candles in the fireplace is great for summer. When I said I wanted a no fuss mantel for summer, this summer mantel from Thrifty and Chic is what I had in mind. It’s simple and I’m pretty sure yellow is Summer’s signature color. Fall is probably the best non-holiday related time of year to be decorating in your home. Especially if Cozy is your thing. And it is SO my thing. I LOVE those pretty white pumpkins on top of the brass candle sticks. And that painting is a great backdrop. I really love everything about this. It’s not fussy, but it still says, I care about how this looks. If you’re a lover of all things neutral toned, you can still have a mantel that screams Fall. This creamy white mantel from Refresh Restyle is a perfect example of not having to go all Orange and Brown just because Fall has arrived. Fall is the time of year when we harvest. I mean, allegedly, I’ve never had a garden that produced anything to harvest, but, it should be a time of abundant pumpkins. 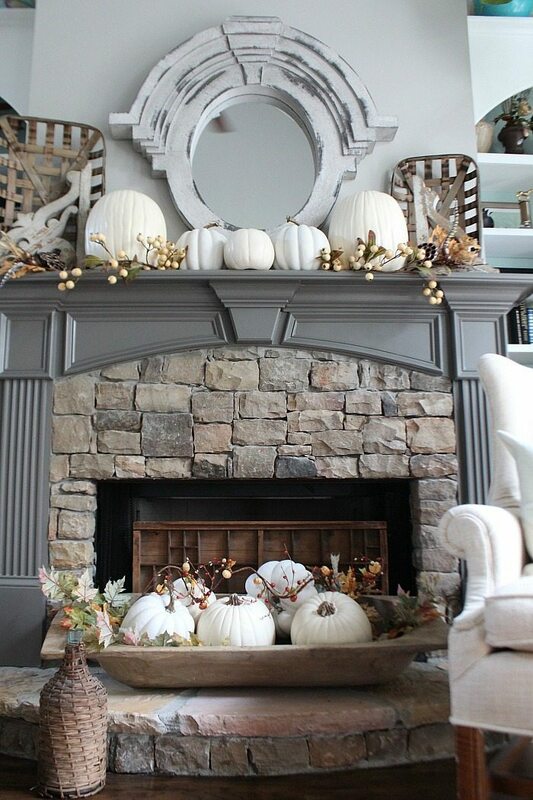 This fall mantel from Sincerely, Marie gets that theme. Orange is a fall color. I happen to love it, but if you don’t it can be hard to add it into your decor. 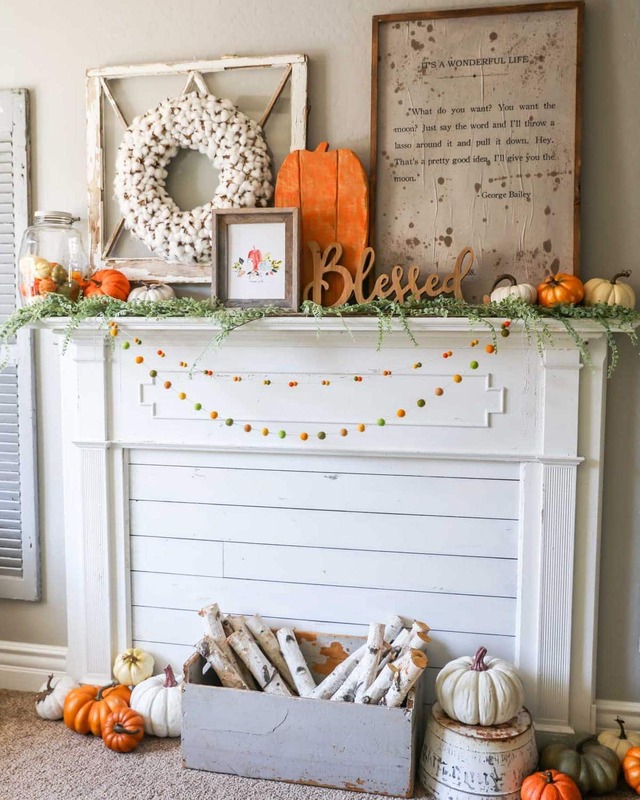 This fall mantel with a pop of orange from Lil Luna accomplishes it perfectly. Also, birch branches are a big YES, always. Whenever you find one, take it home with you. Did I say before that I had a favorite mantel? I lied. This mantel from Sincerely Saturday is my favorite. The colors are perfect, the wood tones are perfect. It’s simple and interesting, at the SAME TIME. That is not easy to achieve. Love everything about this. Let’s make a mantel! Right? Aren’t you all excited to put a mantel together? It’s winter here, but I’m almost tempted to make a Spring themed mantel because, you know what? I’m already over you Winter and it’s only January! If You Loved this, I’d Love It if You Pinned It! Sign up for the Cozy Chaos Newsletter and I'll send you my Cozy Clean Daily Routine. Sign up for updates and I'll send you my cozy clean daily routine. Spend more time comfy on the couch and less time cleaning! I'm Marybeth, creator of Cozy and tamer of Chaos.